The Lyric's mission includes celebrating diverse cultures, with special emphasis on African American cultural heritage, through artistic presentation of the highest quality. With our rotating exhibits in our Gallery & Museum, The Lyric is able to highlight the talents of local, regional and national artists, all free of charge for the public to view and enjoy. Group tours available by appointment - call (859) 280-2201 for more information. In our Museum, The Lyric is extremely proud to feature works of community artists and artist groups who have donated their work to us. These artists represent the diversity and core of our mission, and we are proud to host their work for all of our patrons and supporters to enjoy. Current artists on display: Adan Utrero, Enrique Gonzalez, Agustin Zarate, Jared Owens, Mercedes Harn, 2016 'Artist's Eye' Program Participants. In The Lyric's Gallery Now! Bio: Derek King Jr is an artist based in Lexington, Kentucky. 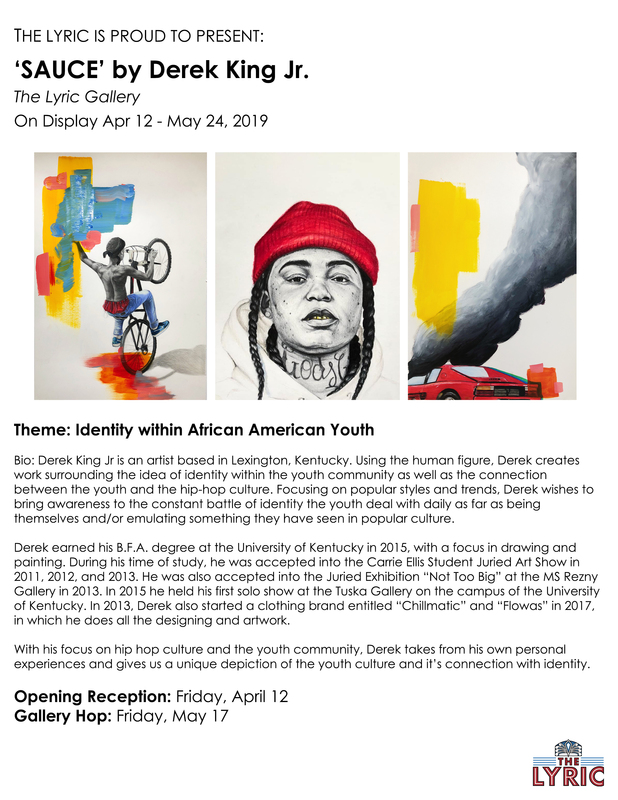 Using the human figure, Derek creates work surrounding the idea of identity within the youth community as well as the connection between the youth and the hip-hop culture. Focusing on popular styles and trends, Derek wishes to bring awareness to the constant battle of identity the youth deal with daily as far as being themselves and/or emulating something they have seen in popular culture. Derek earned his B.F.A. degree at the University of Kentucky in 2015, with a focus in drawing and painting. During his time of study, he was accepted into the Carrie Ellis Student Juried Art Show in 2011, 2012, and 2013. He was also accepted into the Juried Exhibition "Not Too Big” at the MS Rezny Gallery in 2013. In 2015 he held his first solo show at the Tuska Gallery on the campus of the University of Kentucky. In 2013, Derek also started a clothing brand entitled "Chillmatic” and "Flowas” in 2017, in which he does all the designing and artwork. With his focus on hip hop culture and the youth community, Derek takes from his own personal experiences and gives us a unique depiction of the youth culture and it’s connection with identity. 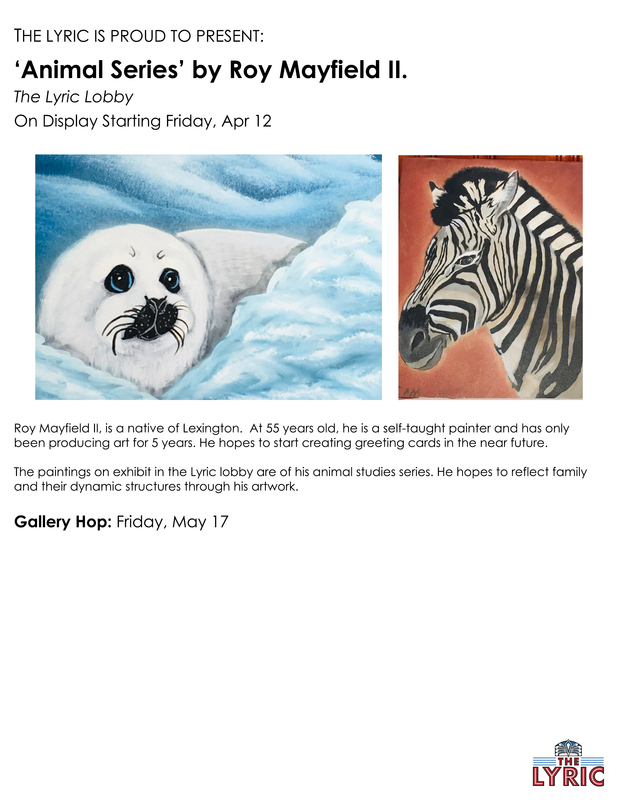 April 12 - May 24: 'SAUCE' by Derek King Jr.
Roy Mayfield II, is a native of Lexington. At 55 years old, he is a self-taught painter and has only been producing art for 5 years. He hopes to start creating greeting cards in the near future. The paintings on exhibit in the Lyric lobby are of his animal studies series. He hopes to reflect family and their dynamic structures through his artwork. Click here to view a catalog of our previous exhibits!